Check out our 2 sided magnet. 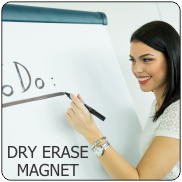 Most of our magnet products are only magnetic on the back surface. This 2 sided magnet has the same magnetic pull on both sides. Two side magnet cuts just as easy as single sided magnet - use scissors, a craft knife or paper trimmer. We offer a wide range of surfaces on both the front and back, solving many issues encountered with single sided magnet. Visually, there's no difference between single sided and two sided magnet, but molded inside the flexible magnet is magnetic ferrite powder under both the front and back surfaces. 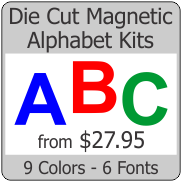 There's many uses for two sided magnet including markings that can be easily flipped over showing a status change such as GO-NO / GO, OPEN / CLOSED, ON / OFF, LOCKED / UNLOCKED, unique color coding and more. There's no need to store the unused magnet if you use 2 sided magnet. Just flip the magnet over.